So forget all the huge "events" I talked about at the start of Part 2, the biggest thing to happen in 1984 was the arrival of radio countdown show Take 40 Australia, hosted by the silky-voiced Barry Bissell. Since we were a single TV, no video household at that point, I couldn't always get to watch the pop music programs - but come Sunday afternoon, I could always listen to Take 40. I wouldn't start collecting the weekly ARIA charts for another few years, so Take 40 was great for keeping tabs on what songs were going up and which were dropping out. And just before Barry played the number 1 song of the week, he'd feature a hit prediction. Good times. At number 20, it's "Message To My Girl" by Split Enz, which was taken from the Conflicting Emotions album and would be the last big single for the New Zealand group, reaching number 12. By this stage, Tim Finn had already departed for a solo career, and it wouldn't be long before the rest of Split Enz, er, split. The break-up didn't really come as a big surprise, given the band's final studio album, released in October 1984, was called See Ya Round, but it certainly was the end of an era. OK, the enz of an era. With the first of three appearances in my top 20, at number 19 it's "All Through The Night" by Cyndi Lauper, who, alongside Madonna, dominated the charts in 1984. This was the fourth single from the She's So Unusual album and her second ballad, following "Time After Time". By this stage, Cyndi didn't even need to make a video for the song to be another big hit. Number 18 is "Doctor! Doctor!" by Thompson Twins, which was the group's second biggest hit in Australia, reaching number 14. I've previously discussed how Thompson Twins was a potentially confusing band name since no one was called Thompson and there were three people in the best-known line-up of the group - but fans of Tin Tin will realise that the name comes from Thomson and Thompson, the detectives that feature in the comic strip. The 1983 single, "We Are Detective", is another nod to the name's source. The best of British came together for the song at number 17: "Do They Know It's Christmas" by Band Aid. Actually, Britain's biggest music names were joined by members of two American acts (Shalamar and Kool & The Gang) and two Irish bands (U2 and The Boomtown Rats, including event organiser Bob Geldof), with Boy George flying back from the States especially for the recording session and some artists even recording a contribution over the phone. Band Aid would start the ball rolling on a number of charitable music releases and concerts over the next few years (including 1985's Live Aid), while "Do They Know It's Christmas" would go on to be remade in 1989 and 2004. At number 16: "It's My Life" by Talk Talk, who we met back in 1982. "It's My Life" wasn't a hit in 1984, either in Australia or the UK - and it would take two more releases for it to make the UK top 20, which it finally did in 1990, coinciding with the group's greatest hits collection coming out. Talk Talk broke up shortly after that in 1992, but this song has lived on, thanks in no small part to No Doubt's remake in 2003. Making his mark in 1984 was the artist at number 15 - it's "Wouldn't It Be Good" by Nik Kershaw, which wasn't actually his debut single (even though it was his first hit). Later hit "I Won't Let The Sun Go Down On Me" originally came out in 1983, but wasn't successful the first time round. "Wouldn't It Be Good" was notable for its, at the time, flashy video, which featured Nik wearing a glowing white suit with lyric-related images displayed on it. One of the year's big soundtrack hits is at number 14: "Footloose" by Kenny Loggins, who would make something of a habit of recording songs for movie soundtracks in the 1980s. Besides his two songs for Footloose - the other was "I'm Free (Heaven Helps The Man)" - he also recorded songs for Top Gun, both Caddyshack films and the Sylvester Stallone flop, Over The Top. "Footloose" spent three weeks at number 1 in Australia, but isn't my highest placed song from the film. We'll get to that track in Part 4. Number 13 is "Out Of Touch" by Hall & Oates, which would be their last Australian top 50 single (it reached number 11). In the States, where they were enormous, "Out Of Touch" would be the last of their six number 1 hits. Their success wound down over the remainder of the decade, but ever since, the duo has carried on touring and recording, and over the years has popped up in the most unlikely of places (a guest appearance on Will & Grace, performances on reality show finales and in web series Live From Daryl's House). 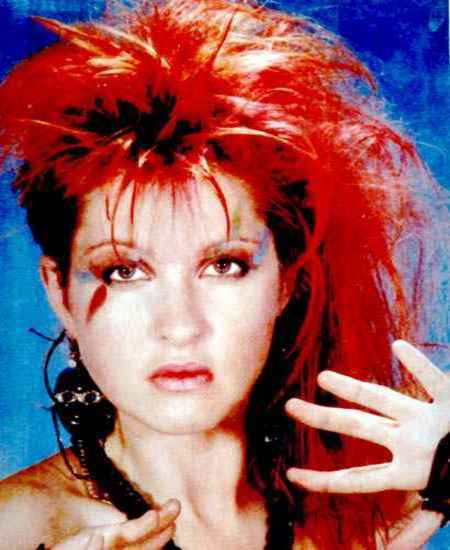 With a song about taking matters into your own hand, at number 12, it's "She Bop" by Cyndi Lauper, which was one of several songs objected to by the Parents Music Resource Center in the US, with the result that warning labels were put on risque records from late 1985 onwards. Despite - or due to - the controversy surrounding "She Bop", it was another big hit for Cyndi, reaching number 6 in Australia. And at number 11 it's "Whatever I Do (Wherever I Go)" by Hazell Dean, the first UK top 10 hit for the production team of Stock Aitken Waterman, who I've gone on about enough on this blog. As for Hazell, 1984 was the year she finally broke through after years of working the gay club scene, with "Searchin' (I Gotta Find A Man)" becoming her first UK top 10 single (and her only big Aussie hit, reaching number 17). This follow-up went one step further to crack the British top 5, but it would take Hazell another four years to land another hit as big. The Top Of The Pops performance below is worth checking out, if only for the fancy footwork from Hazell's two backing dancers. Amazing. So we still haven't reached many of the songs I've been teasing so far. Like Madonna's final appearance for the year, as well as the other Footloose song and the other soundtrack song written by Giorgio Moroder, and the song which featured on the first pop album I ever owned. They're all included in my top 10 from 1984, coming up in Part 4.